I couldn’t decide what type of sauce I was going to make for my Rigatoni and Italian Sausage Dinner. 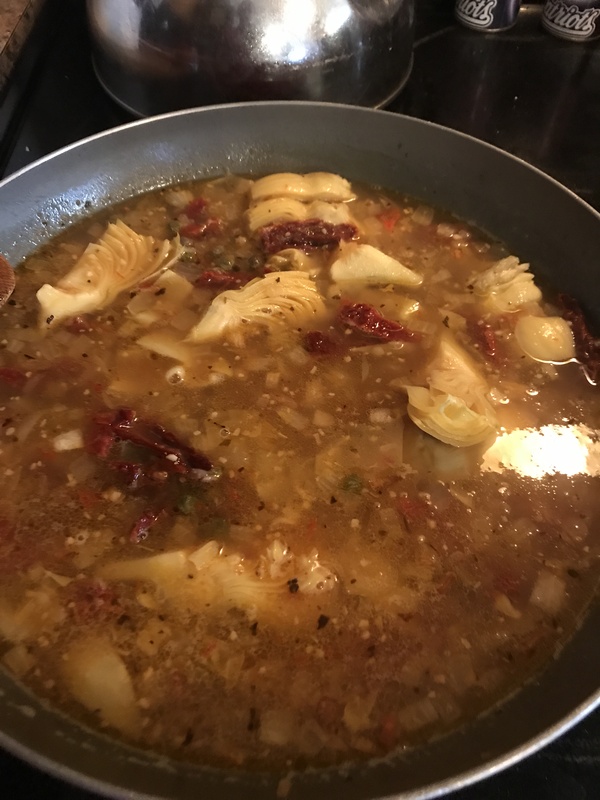 I kept going back and forth…basic red sauce with onions, green peppers, garlic and tomatoes? Roasted Red Pepper Sauce? 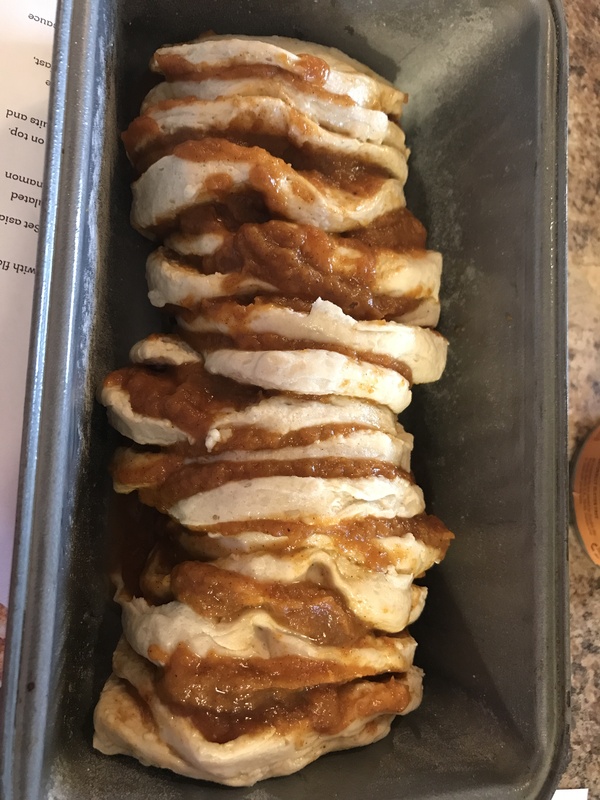 A sauce using the 1/2 can of pumpkin I have leftover? After much debate I decided on the roasted red pepper sauce. A creamy pureed sauce made with roasted red peppers, sauteed onions and garlic, chicken broth and heavy cream. Yes!!! That is what I am craving….. Started sauteing one onion diced with about 1 Tablespoon of minced garlic. Head off to the pantry and grabbed the jar of roasted red peppers. I open it up and wait…those aren’t roasted red peppers. In my hands were sun-dried tomatoes. I guess when I went to the store I bought sun-dried tomatoes instead of roasted red peppers. Usually I like to have both as staples in my pantry but after being on vacation for almost a month the pantry was a little bare and I am in the midst of restocking. Okay–time to regroup. I can do this. Let’s see what else I have in the pantry and fridge. Mediterranean- based pasta it is!!! 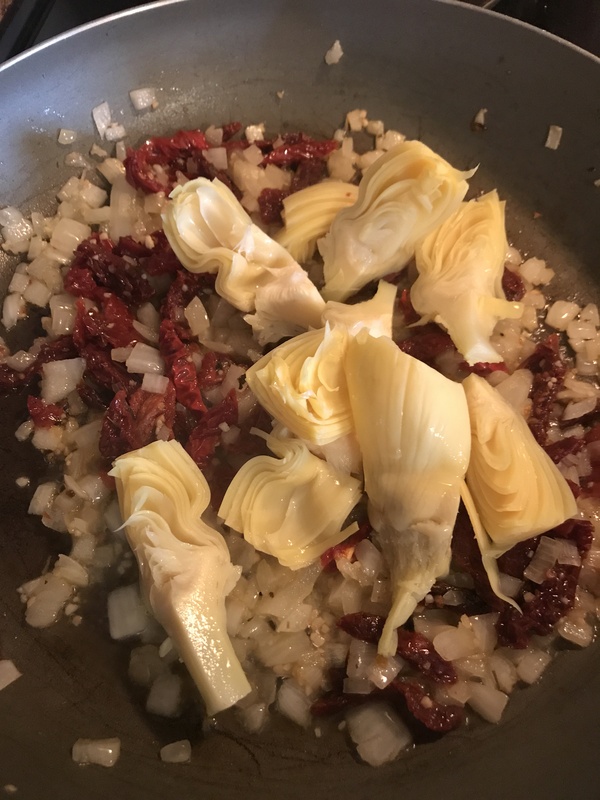 I julienne about 1/2 jar of the sun-dried tomatoes and add it to my onion-garlic mixture, along with 1/2 jar of the artichoke hearts. After a couple minutes, in goes the sparkling apple cider (@1 cup) and about 2 cups of chicken broth I make from the base. 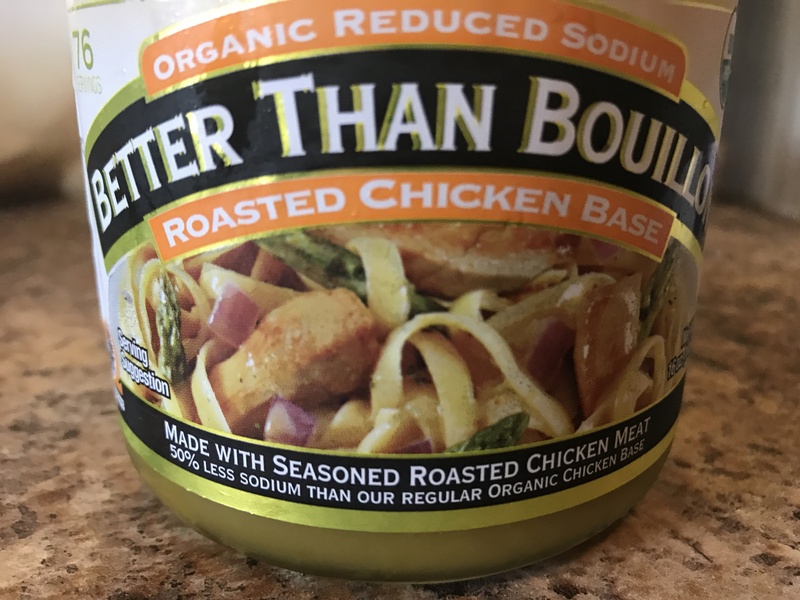 If you don’t have this chicken or beef base in your fridge- go buy it. This is a staple that I have used when I needed it in a pinch. Always great to have it on hand. I let this simmer and reduce a bit then add some capers and the juice of 1/2 lemon. 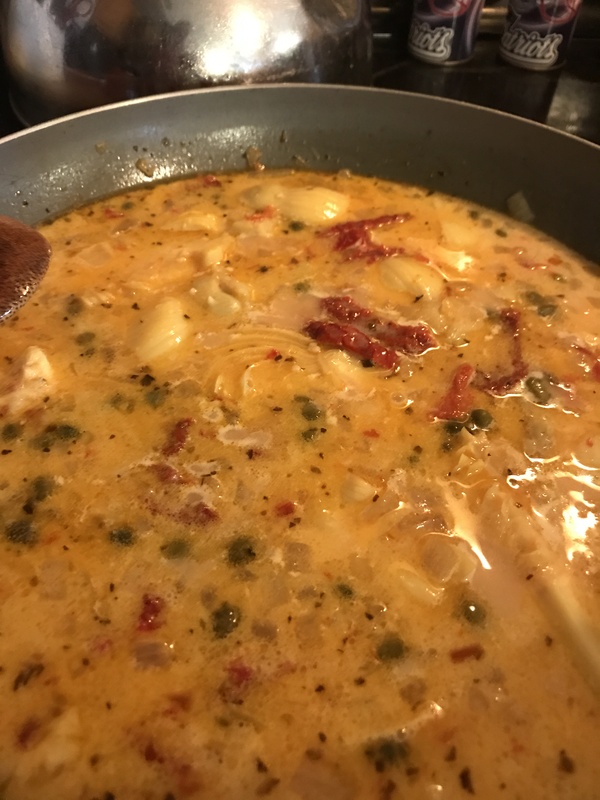 At this point the sauce is delicious and I almost didn’t add any heavy cream but I had it in the fridge so why not…..add some cream and let thicken to your decided consistency. I have to admit I was starving and didn’t let it did long or thicken but it was still wonderful. 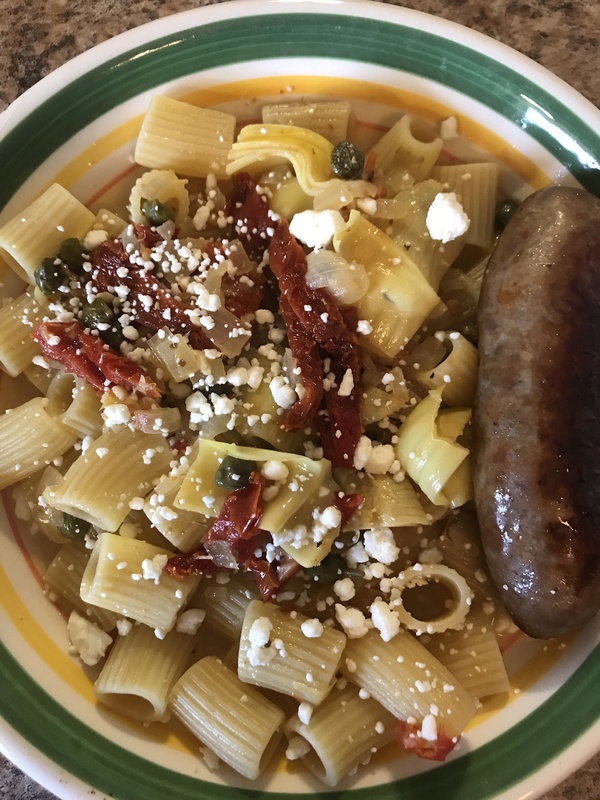 Made my plate and added some feta…..a Mediterranean dish in a flash!!! Without heavy whipping cream. Could just reduce at this point and use. After the addition of heavy whipping cream. Coming into Fall and everything is pumpkin. 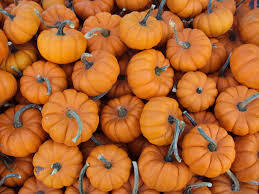 Lucky for me as I am a pumpkin nut. Give me pumpkin bread, pumpkin coffee, pumpkin pasta sauce, pumpkin ravioli…you put pumpkin in it, I want to try it. 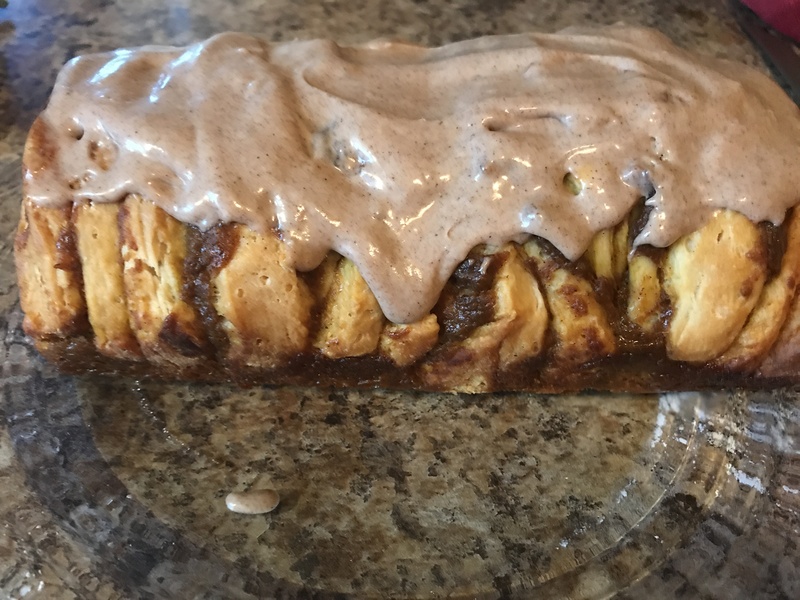 I was excited when I saw a recipe in my Facebook feed for an easy pumpkin pull apart loaf and I had all the ingredients on hand. I didn’t save the link as I figured I could easily find it one the internet. When I decided today is the day I did a quick google search and came up with a multiple recipes for this treat. Below are 3 that I found. 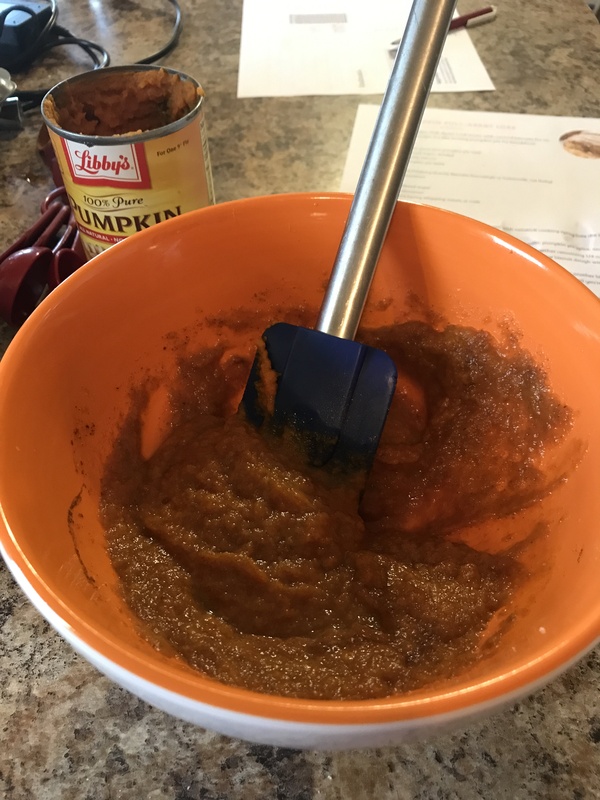 There are minor differences in each if you take the time to review..pumpkin puree (not pumpkin pie mix), pumpkin pie mix, egg, no egg, and cooking time. I decided to make the latter recipe from Crazy for Crust. 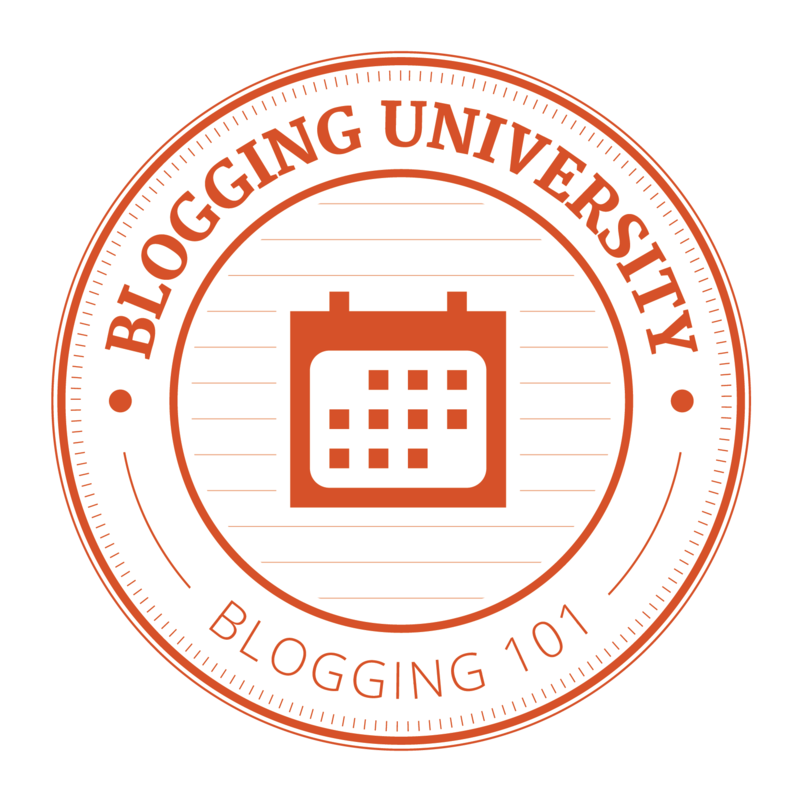 I am not going to repeat the recipe as you can easily go the website for yourself. 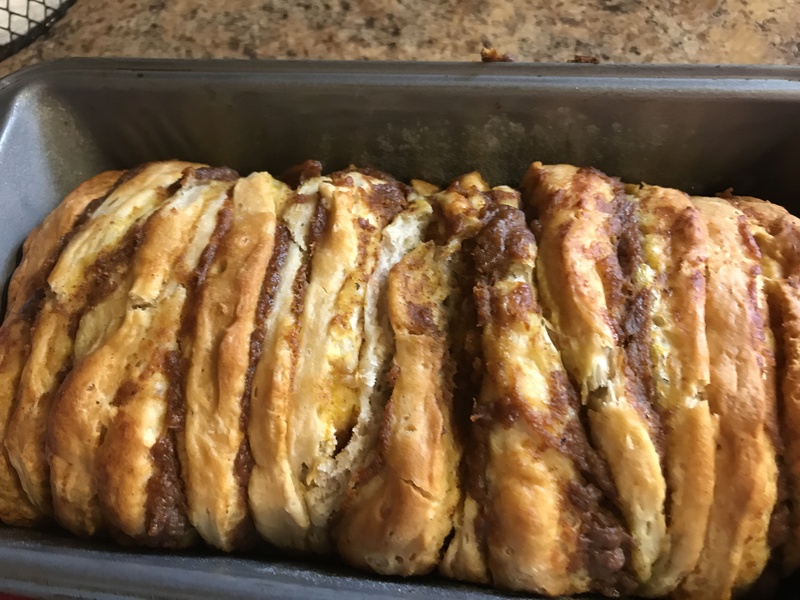 I will say that the cooking time on this recipe is only 18-24 minutes and I had to cook it for 30-45 minutes which seems more inline with the 2 other recipes. In the end, it was delicious and a great easy find for a quick treat. The glaze is to die for and can be used on other treats. In fact, I think I will use the glaze for my sourdough cinnamon rolls. I will have to try this with apple butter or another fruit based product. Glaze: 1/2 cup powdered sugar, 1 teaspoon cinnamon, and 3 Tablespoons heavy whipping cream. I may even try substituting pumpkin pie mix or just nutmeg for the cinnamon. 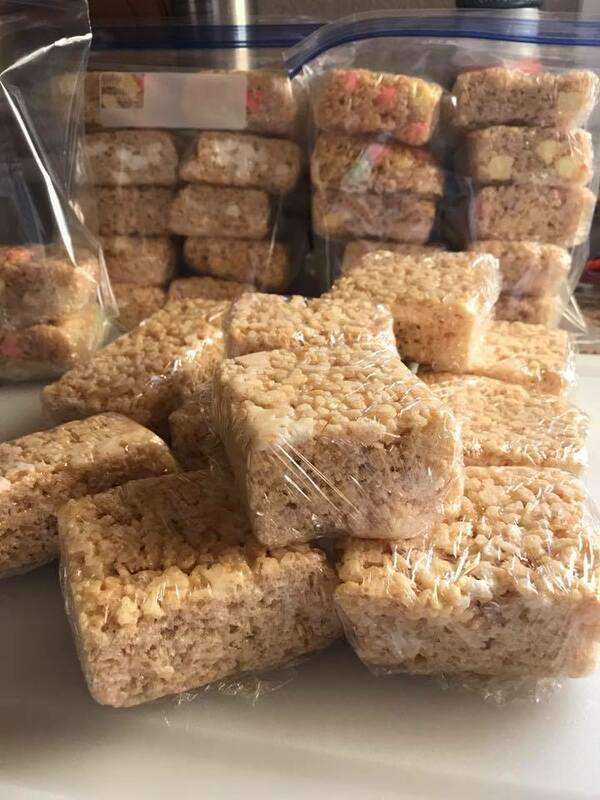 I just got done making a bunch of Rice Krispie treats for a football fundraiser. Who doesn’t like that ooey gooey treat? This classic treat is so easy to make and the original recipe only calls for 3 ingredients: butter, marshmallows and Rice Krispie cereal. When I make these treats I like to make them bigger and…of course, I have to tweak the recipe. First, let me give you the classic recipe: 3 Tablespoons butter, 1 package (10 oz) marshmallows and 6 cups Rice Krispie cereal. In my recipe we are going to add to other ingredients…salt and vanilla. Salt? YES! Salt brings out the richness and overall flavor. Since we are adding salt make sure you are using unsalted butter and USE REAL BUTTER! It will make a difference. Line your 9 X 13 pan with foil and spray with cooking spray to make it easy for removal. Heat butter over medium heat in a large pot to melt. Once melted add the salt, vanilla and a 1 1/2 bags of marshmallows. Turn down the heat to low- meat and stir until marshmallows are melted. Remove from heat, add cereal and remaining marshmallows. Stir until all ingredients are incorporated. Pour into your prepared pan and even out. I find the best way is to lightly spray a rubber spatula with cooking spray and use that to spread the mixture. 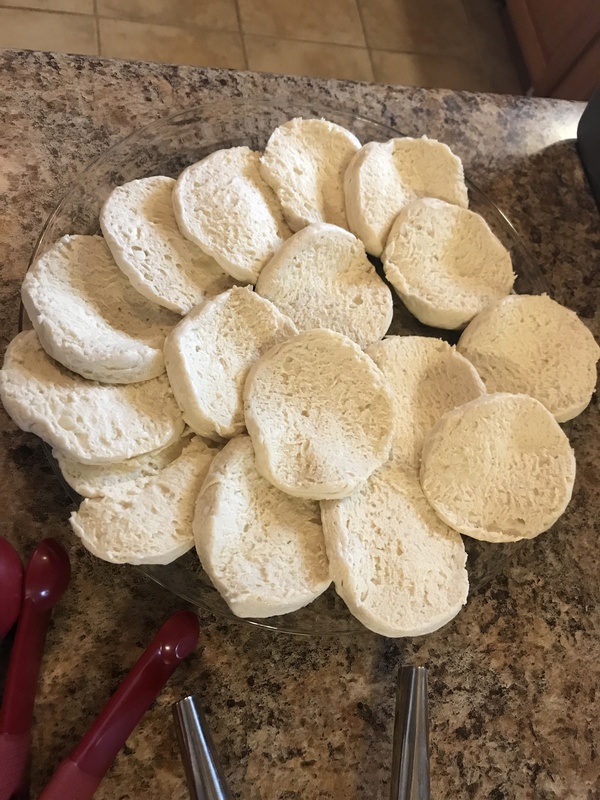 Another trick…after you have it pretty evenly spread out cover with plastic wrap and take another 9 X 13 pan and use it to press down lightly over the mixture. This will give you a nice even top. Let cool (at least an hour). Flip you pan over on a cutting board and the treats should easily come out and you just have to remove the foil. Slice to your desired serving size and enjoy. I like to individually wrap in plastic wrap and then place in a plastic ziploc bag or container to keep fresh. Can I use regular size marshmallows? Yes, however the reserved 1/2 bag that is added with the cereal will have to be cut. You don’t have to add more “mini” marshmallows at the cereal stage but it adds a nice surprise through the treat. Hint: If cutting your full size marshmallows use a little cooking spray on your scissors/knife. Do I really have to use 12 Tablespoons of butter? Of course not…but as the saying goes “everything tastes better with butter”. I provided you with the original recipe and you can see it only calls for 3 Tablespoons of butter, 1 bag of marshmallows and 6 C of cereal. You can easily lower the amount of butter but I would still use at a minimum 6 Tablespoons. The great thing about rice krispie treats is as long as you have the general ratios it will all be okay!! Trust me there have been times when I had to use less butter, more or less marshmallows/ cereal and guess what??? The treats were still all gone in a flash.